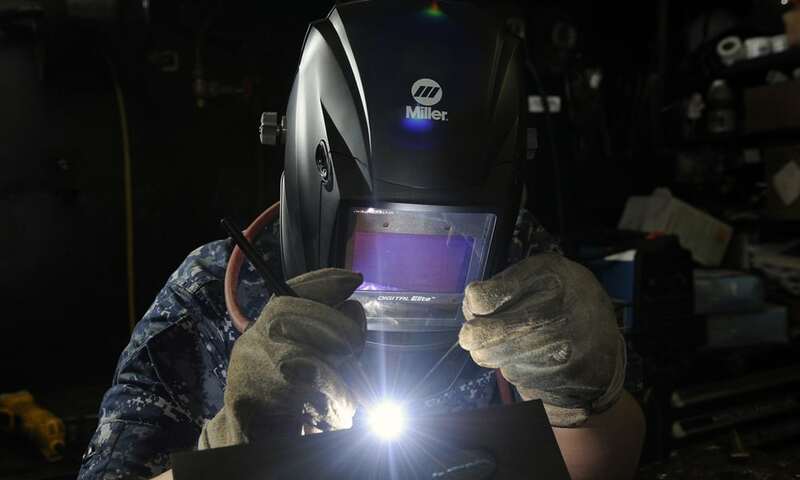 Metal inert gas welders—also known as MIG welders or gas metal arc welders (GMAW)—are the most commonly used welding machine, competing with the also successful TIG (tungsten inert gas or gas tungsten arc welding) and stick welders. For both at home and industrial use, metal inert gas MIG welders are known for their efficiency at fusing all kinds of metals together. Dependent on your welding skill level, whether you’re experience or looking to start welding; a metal inert gas level could be a process you’d want to try out. Many veteran welders would agree that the greatest advantage that comes from a metal inert gas MIG welder is its speed. The pace of these premium and cheap welders is unmatched when compared to stick welding and TIG welding, both of which can take a bit longer. For this reason, the metal inert gas welder allows for much faster production rates than the other welding processes (which is a reason for their being used so often in mass production). View the Best MIG Welder on the Market, Below. What is a Metal Inert Gas Welder? How do you set up a metal Inert Gas Welder? What can you weld with a Metal Inert Gas Welder? What is Flux core Wiring and can my Welder use It? Therefore, a metal inert gas welder is faster to learn for a totally novice welder. Buying one means having the vast majority of the welding tools you need sent to your door in one box. In general, they take less than an hour to set up and make for quite easy welding. Compared to the other common types of welding we have mentioned, the skill level of the welder is not nearly as important. Almost anyone can learn how to MIG weld with one of these machines after an hour or so of practice. Through our extended research of these particular welders, we found dozens of videos and articles and reviews to guide the viewer through the process of buying, setting up, and using these machines. We hope this buying guide will help you in choosing the welder that most suits your needs. After further explanations of the welding process and what to look for when buying, there will be a list of ten well-known metal inert gas welders that will each be reviewed briefly. There are many considerations that go into the purchase of a metal inert gas welder. First and foremost on your mind should be the question of what you hope to accomplish with your new machine. Are you looking to MIG weld metals beyond a thickness of half an inch? Unfortunately, that is not usually possible with a metal inert gas welder, as you will soon learn if you read on. However, there is a myriad of projects that only require the fusion of thinner metals. You might be surprised at the wide array of things it’s feasible to build with a metal inert gas welder. A stool for your workshop, a workbench, or a tool rack can all be assembled with the help of a little know-how and a metal inert gas MIG welder. The most basic thing to consider is what power input your welder produces. Basically, the input power is the voltage that your metal inert gas welder will run at. Please keep in mind that not every welder is compatible with your workshop’s outlets! If you find a welder with an input power of 110 to 140 volts, then you likely have nothing to fear: standard household outlets run at about this range. On the other hand, some of the premium and cheap welders on the coming list will only run at around 220 volts power input, or else they are capable of being switched to running at this higher input voltage. In these cases, you will need a different type of outlet entirely. This would be an involved, do-it-yourself project (or one that will require a good electrician and some extra spending money to boot), and you may just want to opt for a welder with 110 volts of power input rather than going to all that trouble. The duty cycle is another important factor. It basically comes down to the efficiency of your machine. The duty cycle determines how long you can weld for in order to optimize the lifespan of your machine. You’ll see phrases like, “This welder has a 20% duty cycle when running at 90 Amps,” or “When operating at 135 Amps, the duty cycle is 35%.” Let’s translate this into the amount of time you can weld. The standard is to look at the time in ten-minute increments. This means that you can, with a 20% duty cycle at the correct amount of Amps, weld for a total of two minutes. It is then most wise to let the machine rest for the remainder of those ten minutes. So, work for two, rest for eight and repeat. A 35% duty cycle would mean working for three minutes and thirty seconds, followed by resting for six minutes and thirty seconds. The amount of Amps always varies from welder to welder and is easily adjustable by a dial on your machine. A smaller factor to goes into purchasing a welder is the weight of the product. On average, the products on this list weigh 50 or more pounds, while some are in the thirties or below. Still, others far exceed these weights. Products weighing 50 pounds are still easily portable but might require the use of a wheeled cart to more effortlessly move them. A few of the products listed have a very handy safety feature called thermal overload protection (don’t forget to wear welding helmets and a welding mask, though!). This check makes sure that your welder doesn’t overheat and shut down. The LOTOS MIG175 175Amp and the LONGEVITY Mig weld 140 are both models that include this. Similarly, the Lincoln Electric K2185-1 Handy has a cooling fan to prevent high temperatures, and the Hobart 500536 Ironman even has a “fan-on-demand” that is triggered when overheating is sensed during the welding process. Overall, the risks of overheating include wasted time and increased the expenditure of shielding gas, so the thermal overload protection is a nice feature to look out for if you can afford it. What Metals can I Weld? This varies from model to model, and I’ve listed what each welder is capable of in the ten product reviews below. Typically, a metal inert gas welder can process mild steel, stainless steel, and aluminum. A few of the welders listed can also handle iron, cast iron, and even a few alloys. A metal inert gas welder can only handle so much. On the whole, these welders can weld from a thinness of 24 gauge (about 0.0239 inches) or 18 gauge (about 0.0478 inches) materials all the way up to around 3/8 inch or even ½ inch materials. For much thicker metals, a stick welder would be ideal. As promised, here are ten top of the line metal inert gas welders, chosen because they offer an easy, superior weld. There’s something for everyone here: these welders range in price from $99 to over $3000. Hobart is an American welding company that has produced quality machines since its inception in 1917. Often toted as the best MIG welder for beginners, the Handler 140 is an affordable and easy to use machine right off the bat. Though its duty cycle is on the low end when compared to the other welders on this list, the Handler is a crowd favorite. It is also fairly easy to carry. Welders will love the portability and ease of use. A home hobbyist will get years of use and enjoyment from this powerful machine. All in all, it’s a very sturdy machine and is manufactured in the USA. The Handler 140amp MIG welder is able to weld both steel and aluminum. It comes with flux core wire included. It welds 24 gauge mild steel up to a thickness of ¼ inch. It’s able to run at 20% at 90 Amps (in other words, you can run the machine for two minutes and let it cool down for eight). The Handler 140amp MIG welder operates off 115 volts, meaning it will run on the standard household current. See more information on Hobart 500559 Handler 140. Miller is a Wisconsin-based company that has been in the business since 1929. At just 38 pounds, the Millermatic is ultra-portable and is one of the lightest welders on our list. It is preferred by amateur welders and professionals alike for its usability. It is also one of the most expensive at over $3300, so bear that in mind as you read on! The Millermatic runs at dual voltage. It welds stainless steel, mild steel, and aluminum (with the help of a spool gun). It can weld mild steel to a thickness of 3/8 inches, giving it greater ability than the Hobart Handler. As for its aluminum welding capabilities, it can weld from 18 gauge to 3/8 inches again. It comes with flux core abilities. At the 120 volt input, it will run at 115 Amps for a 20% duty cycle. At the 240 volt input, it will run at 150 Amps for a 40% duty cycle. The Millermatic is able to run at 120 and 240 volts. The Millermatic is only 50 pounds. See more information on Miller Electric Millermatic 211. At just $99, the Goplus is a fantastic value considering what it is equipped to do. In fact, it is the most affordable welder on our list, beating out its competitors by hundreds or even thousands of dollars and putting it in a class of its own. For a budding hobbyist not yet sure if welding is for them, you can’t go wrong with the Goplus. After all, for $99 its welding thickness and the duty cycle is about what one would expect (don’t look to buy this welder if you want it for heavy duty use). The Goplus is light and compact when compared to most other welders. Flux core wire is included. It has four levels of easily adjustable current flow and ten levels of wire speed. The Goplus is able to weld steel and iron at below ¼ inches thickness. At 80 Amps the duty cycle is 10%, while at 105 Amps the cycle is 15%. The input power of the Goplus is the standard 110 volts. It weighs just 35 pounds, making it the second lightest welder on this list. See more information on Goplus MIG 130. Lincoln Electric is an Ohio-based company started all the way back in 1895. For over 120 years, Lincoln has produced some fine quality welders, and the Handy is certainly one of them. At about $300, this welder is a bargain while also offering great results. For around $200 dollars more than the $99 Goplus, users can expect an uptick in overall power and performance. As this Lincoln welder is well known for being both reliable and durable, welders who aren’t expecting an overabundance of power will love this machine. People who have purchased the Lincoln Electric K2185-1 Handy MIG welder remark that it is stable and long-lived even with daily use. The Handy Lincoln welder is able to weld mild steel from 24 gauge up to 1/8 inches thick. It has four output power settings that the user can dial in. The fan cooling system reduces the risk of it overheating. At 70 Amps, the Lincoln welder will run at a duty cycle of 20%. With an input power of 115 volts, this Lincoln welder can be run using the average household outlet. The Handy Lincoln welder is very portable at 46 pounds. See more information on Lincoln Electric K2185-1 Handy. 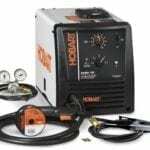 Compared to the Hobart 500559 Handler 140amp MIG welder above, the MVP is a more powerful, dual voltage MIG welder for beginners. Its heavier and about $300 more to buy, but the thicknesses it can weld are greatly increased. It has several power outputs to choose from. The bottom line is that the MVP is worth buying if you need more power than the Handler 140 can offer. For beginners and pros alike, the MVP lives up to its name. This is a dual voltage machine that can weld from 24 gauge to 3/8 inches of steel. Among the metals, it can weld are steel, stainless steel, and aluminum. The MVP has 7 power settings to choose from. The spool hub can handle both 4 inch and 8 inch reels. On its 115 volt input it can work at 20% at 90 Amps. On its 230 volt input it can work at 30% at 150 Amps. You can easily switch between 115 volt or 230-volt input power. It weighs in at 87.5 pounds, making it a bit less portable than some of our other options listed. See more information on Hobart Handler 210 MVP. LOTOS Technology is a California company that has only been around since 2007. Still, the LOTOS MIG is impactful and high quality enough to make it onto our list. This one is a versatile machine that is a fair price of about $400. And—provided that you have the necessary 240-volt outlet in your home—it can be set up in a matter of minutes. 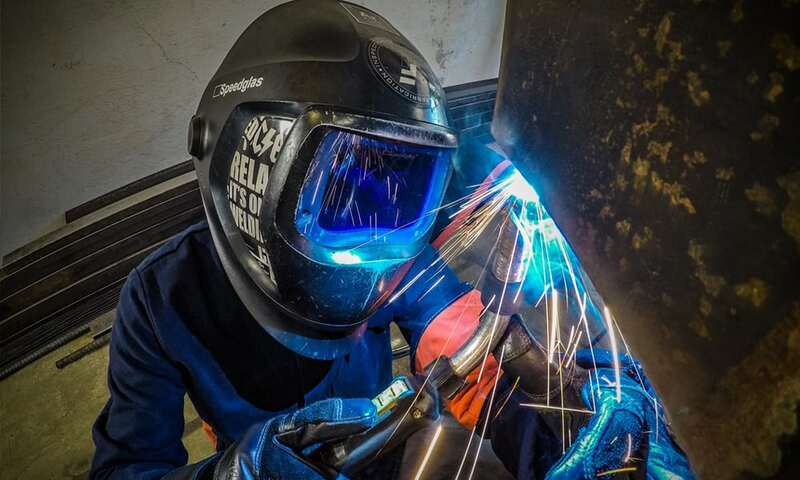 The duty cycle of this welding newcomer is impressive, and it can be utilized by pros and amateurs who have been continually impressed by the bang they’ve gotten for their buck. The LOTOS can weld steel and stainless steel from 18 gauge to ¼ inches and aluminum to 1/8 inch or thicker. Thermal overload protection doesn’t let this machine overheat, and infinitely adjustable heat/amperage as well as wire speed makes using the LOTOS simple. Check out the LOTOS MIG140 for a lower power alternative. At 175 Amps the duty cycle can work at 20%, and at 135 Amps it can do 30%. It has a high input power of 220 volts, so a standard 110 volt household outlet isn’t going to cut it this time. 220v MIG welders are not to be taking lightly! The LOTOS weighs in at 85 pounds. See more information on LOTOS MIG175 175AMP. Forney Industries is an American company that was founded in 1932. Forney’s 309 140 is affordable and able to weld many metals. As you’ll see below, its duty cycle is hardier than most, so you can work for much longer without breaks. It is about the same price is the Hobart 500559 Handler 140, but you’ll that the Forney is less suitable for any heavy-duty welding projects you might want to commit to. Therefore, the Forney is ideal for household use, provided that the use isn’t too demanding. It welds up to ¼ inches and includes flux core. It is capable of welding mild steel, stainless steel, aluminum, and cast iron. The Forney is able to use 4 inch and 8 inch wire spools. The cast aluminum wire feeding system ensures that the wire won’t tangle as much while it's fed through. The Forney easy weld can run at 20% on 115 Amps and at 35% at 90 Amps. With an input power of 115 volts, it can be run on most outlets. This Forney easy-weld weighs about 56 pounds. See more information on Forney 309 140. LONGEVITY Inc is a company that has been around since only 2001. Like LOTOS Technology, it still produces a fine enough quality welder that it has earned its spot on this list. Besides the gas cylinder, this welder comes with everything you need to get started and is simple to set up. With all this, along with its solid performance, this machine is marked at a fair price of under $400. Though it is manufactured in China, the LONGEVITY Migweld is still a quality welder. It is most well-adapted to light use. Compared to Miller and Hobart’s machines, the price is somewhat better without sacrificing much quality. It welds from 24 gauge to ¼ inches of steel. Flux core is available for this welder. The LONGEVITY can run at ten different voltage settings. As an added bonus, it has thermal overload protection like the LOTOS welder. At 90 Amps the LONGEVITY can run at 20%. It has the standard power of 110 volts. The LONGEVITY weighs 54 pounds, putting it an average weight that’s comparable to the weights of the Handler 140, the LOTOS, and the Forney 309. See more information on LONGEVITY Migweld 140. Like LOTOS Technology and LONGEVITY Inc, Everlast has a little over a decade in experience. It is a California company which was founded in 2004. The light and efficient Everlast welder has one of the best duty cycles on our list. With the most basic of designs, this Everlast power-mig welder is perfect for novices. Along with other welders with 4, 7, or 10 voltage settings, the Everlast has infinite settings for voltage and also wire speed, making it a customizable experience. The Everlast 140amp MIG welder can cut mild steel, stainless steel, as well as chrome-oly at a thickness of 3/16 inches. It can be used with both four-inch and eight-inch wire spools. It’s incredibly lightweight for the power it gives out. The Everlast 140amp MIG welder has a 25% duty cycle at the maximum 140 Amp output. It also has an excellent 35% duty cycle when running at 135 Amps. The Everlast 140amp MIG welder has an input power of 120 volts as well as one of 110 volts. At only 28 pounds, this Everlast welder is by far the lightest welder on our list, beating out the second lightest competitor (the Goplus) by seven pounds. See more information on Everlast i-mig140e. The Ironman is a high-powered welder that is very different from the other welders on this list! Boasting more power, the best duty cycle, and a weight that dwarfs the others, the Ironman is nearly without compare. Obviously, this is not the machine that a budding welder should vie for. It’s super heavy duty and will set the consumer back $2000. It welds from 24 gauge to an amazing ½ inch thickness for steel. The Ironman can handle steel, stainless steel, and aluminum. It is capable of Flux core. The “fan-on-demand” cooling system works as needed, offering up a reduced use of power. There are twelve voltage power settings. The Ironman has infinite adjustment for wire speed. Operating at 60% at 175 Amps, the Ironman has the single best duty cycle on our list. The input power is 230 volts, so standard household outlets won’t be able to handle the Ironman’s power. Weighing a massive 224 pounds, Hobart’s Ironman is by and large the heaviest welder here. See more information on Hobart 500536 Ironman. 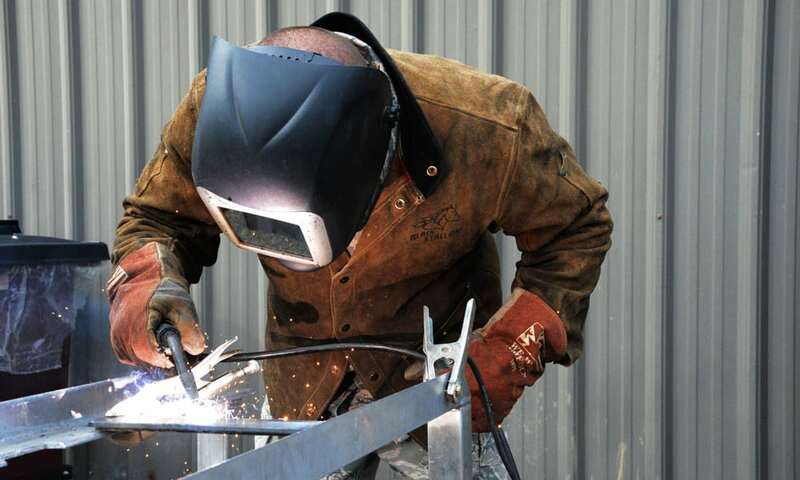 These are common welders that are attractive due to their cheapness, speed, and ease of use. How do they work? Simply put, when the trigger of these welders is held down, a metal wire is continuously fed out. A shielding gas is also emitted. Combined with the heat, these factors melt and fuse the two metals that need to be welded. First, if you have a fume extractor, place it over the area where you will be doing your welding. Next, attach the ground clamp to something metal so you can avoid getting shocked. Then, ensure that the adjusting screw of your gas cylinder is loose. Next, open the cylinder using the handwheel at its top. Read the gauge to make sure you’ve adjusted it to the right pressure. After, turn the adjusting screw so that the gauge reads out 10 to 15 CFH (or cubic feet per hour). You’ll also need to figure out your welding settings with the help of a chart that will likely come with your welder. There are some questions that need to be asked before welding two pieces of metal together! What type of metal needs to be welded? And what is the material thickness of the metal? Both of these will determine both the wire speed and voltage you should use on the metals. Now you can turn on the welder itself and adjust these two important factors in order to get the cleanest weld possible. As hinted at earlier on, there is a disadvantage to this type of welder: only metals of thin to medium thickness can be welded. You’ll find in this buying guide that these welders can fuse metals from a thinness of 18 gauge to a thickness of a half inch at most (though most on this list can only fuse up to about 3/8 inch thickness with the notable exception of the Hobart 500536 Ironman). This welding is actually most commonly used to repair cars, motorcycles, and other vehicles. Also, it is used a lot in construction. Lastly, since metal inert gas welding is so cost efficient and quick, it is often used for the mass production of, for example, computer parts and ship parts. Metal inert gas welders use a cylinder of shielding gas to get the welding job done. But gas can get costly over time. It also makes the machine a little less portable. Luckily, some of our welders can also use a process called Flux core welding. This is achieved with a Flux core wire that contains elements of shielding gas that are released with the heat from the welder. Without gas cylinders, Flux core welding can become that much more portable. Also, welding outside in the elements can be a hassle for metal inert gas welders. With Flux core wiring, working outside becomes practical. Flux core wiring also helps when you’re working on a welding project that your welder simply can’t provide the amperage or power for. Sometimes a metal is just too thick. Flux core wiring alleviates this issue, offering a boost in power. Whether you’ve been welding all your life or are new to the game, a metal inert gas welder will more often than not be a streamlined, simple to understand the machine. As discussed, the initial setup takes less than an hour. With the guidance of the chart that comes with the welder, you’ll know the wire speed and input voltage needed to properly fuse your selected metals together. There is also a wealth of Youtube videos dedicated to the cause of teaching you the basics as well as the more advanced properties of welding. Perhaps most important is knowing that metal inert gas welding isn’t applicable to every project. As said above, there’s only so much variance in thickness that the welder can handle. Stick welders and TIG welders are the other common types of welding machines that can prove more valuable in welding certain metals that a metal inert gas welder can’t. Before making a purchase, research is king. This article is only a springboard, as there are many more brands, names and models of welders out there waiting to be found. A prospective buyer can’t go wrong with joining a welding forum and asking for further advice from the ones who know welding and what it’s like to be on the market for a first welder. If you’ve chosen to weld aluminum rather than steel, a big problem is the wire getting jammed in the torch as it’s fed out. An optional spool gun (usually sold separately) will reduce any wire jams. Metal inert gas welding was invented in the 1940’s. At the time, it was prized for its ability to fuse aluminum but now welds a wide variety of metals. We hope you enjoyed our article on "The 10 Best MIG Welders For the Money", if so, please share and rate it.